The 1991 animated musical Beauty and The Beast is beloved. Audiences and critics went insane for the animation that perfectly mimicked the thrill of epic live-action cinematography, an engaging story and Broadway caliber songs by Alan Menken and Howard Ashman. It was the first animated film to ever get a best picture Oscar nomination and spun off into a highly successful (at least financially) Broadway production. 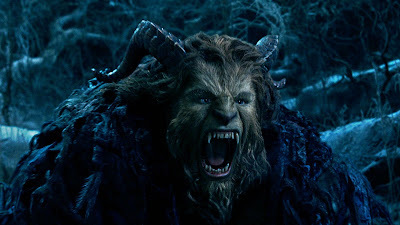 After scoring with a slew of live-action versions of Disney classics (The Jungle Book, Cinderella, Alice on Wonderland), the studio has returned to this tale as old as time. Surprisingly, many of the elements are arresting, with casting, script, acting and design all in top form. There is only one facet that fails and for a musical, it's a gigantic issue. 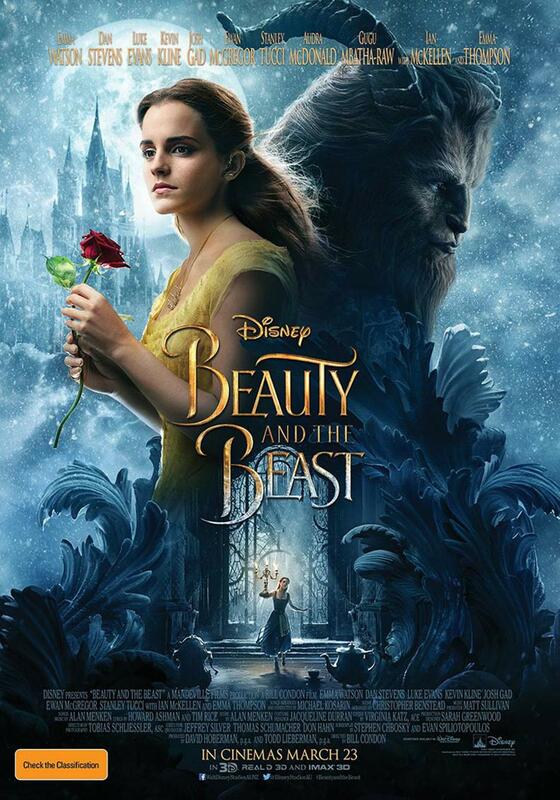 Following the framework set up by Linda Woolverton in the '91 film, Belle (Emma Watson) trades her life for her father’s (Kevin Kline) when he accidentally wanders into a cursed castle and is taken prisoner by a beast (Dan Stevens). She remains in her father's place and though the castle is a haunted gothic monstrosity, Belle finds the beauty in the palace and even the beauty in her misunderstood, hostile captor. With the help of several inanimate servants, like a candelabra (Ewan McGregor), a clock (Ian McKellen), a teapot (Emma Thompson) and a dresser (Audra McDonald), she turns this hell into a home. Back in town, a blowhard with an ego bigger than Disneyland (Luke Evans) expects Belle to be his wife, whether she chooses him or not. The cast is impeccable. Watson and Stevens make charming lovers. The love blossoming between them is affectionate and grounded. Instead of playing to the rafters, Evans is appropriately villainous but in more subtle ways. Gad makes a hilarious sidekick who functions as a fully-realized character with feelings (not just those of passion for Gaston as reported recently in the news) and a conscience. McGregor shows off a Broadway caliber voice as he had in Moulin Rouge. Kline is more fatherly than the original incarnations. Maurice is still a bit eccentric, but his kindness, ingenuity and tenderness with Belle shines through. The script by Stephen Chbosky and Evan Spiliotopoulos perfectly transforms a cartoon into a live-action film. Some of the more buffoonish characters are more realistic and empathetic than their clownish versions. The dialogue sounds fresh and funny. The script does bring up some layers that could have enhanced the story if handled better, but wind up slowing down the film. 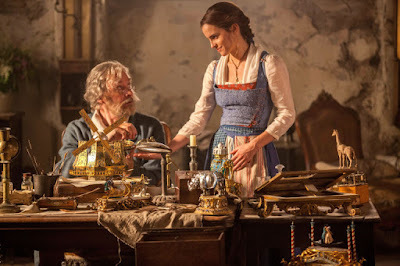 In this film, Belle has inherited her father's passion for inventing, as can be found in an early scene where she creates a washing machine. But never does that kernel of an idea sprout throughout the film. It's completely forgotten. There's also a revelation towards the end between Maurice and Belle wherein she finally understands why they left their past life in Paris. Yet, never before in the film had Belle given any indication of resenting her father, so it's unclear why she's suddenly forgiving him. She was never standoffish or even a bit concerned about her father's motives at any time earlier. Director Bill Condon has assembled a Candyland of visuals. The costumes are luscious (the introduction to Belle's iconic dress is a dazzling moment); the sets are magnificent. Everything looks worthy of the original sumptuous ink and painted designs. The original movie was an homage to the Broadway musical genre with every song representing a component of the classic musical structure. Condon plays on that concept by echoing famous musicals of the past: Belle glides on a grassy hill just like Maria in The Sound of Music; during "Be Our Guest," when Lumière (McGregor) says the word cabaret, John Kander's famous vamp can be heard; in the same song, Lumière dances in the water as tribute to Gene Kelly. The score is where things turn problematic. 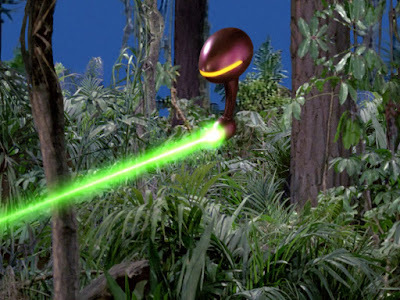 Most of the popular songs have returned, but the score sadly misses "Human Again" (a song that was cut from the original film but was returned in later releases and the Broadway musical). 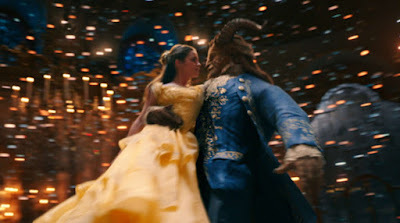 The new songs, like "Evermore" for the Beast and "How Does A Moment Last Forever" for Maurice, lack the style and nuances of the original score. Anthony Van Laast's choreography is unimaginative. The biggest issue, one that is inexcusable in a musical, is the sound mixing is way off. The orchestra overwhelms the singers so that all the lyrics are unintelligible. My spouse performed in various international productions of the show for over three years and even he could not decipher what the actors sang. For a musical, that is a cardinal sin, and could have been an easy fix. Turning the cherished animated film Beauty and The Beast into a live-action replica was a risky venture and one that Bill Condon, for the most part, excelled. With a bit of editing and more adept sound mixing, this could have been a classic. Here's wishing for a future director's cut. I keep meaning to have my wife watch the 1946 version, so she'll understand why there's the animated bric-a-brac in the first Disney version.